Progress, people, progress. Progress is one of the many reasons I am constantly reversing any reason that might pop up in my head to call another city home. Progress is why the capital region is continuing to prosper, why our local cities and counties are finding their way onto lists of “best places to live”, “wealthiest” and more. Progress is why those in the D/M/V might find their commutes more painful and their cars dusty from never ending construction, however, without progress, we would find ourselves in a state of regression. And that, my friends is nowhere we want to be. The latest out of Old Town Alexandria (where historic meets progress) is the soon to be openedÂ Waterfront Market. 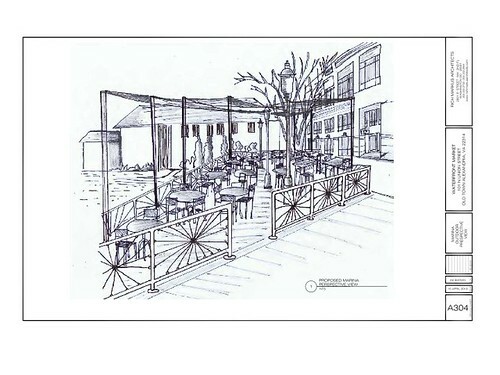 This is a concept by local catering/cafe proprietorÂ Jody Manor (Bittersweet) and it is taking shape on the Alexandria Waterfront. With construction well underway, an the anticipated gourmet market will take full advantage of the city’s ample views and setting along the Potomac. 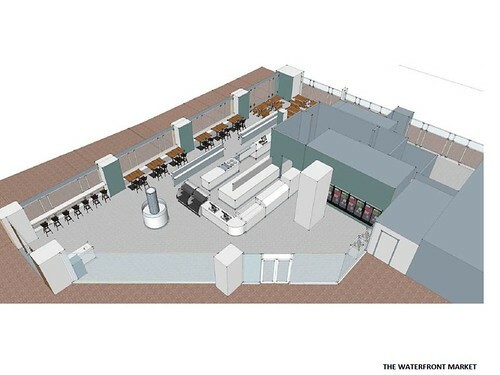 The Waterfront Market will cater to visitors and will also serve as a local gathering place for residents, with outdoor seating and grab-and-go meals. The 4,000 square-foot market and cafÃ© will be located at the newly minted 7 King Street address and will offer custom sandwiches, flatbreads, sushi, weekend brunch, and other quick service items. The retail market will sell gourmet grocery items, fresh produce, roasted chickens, salads, and side dishes as well as a comprehensive selection of craft beers and local and international wines. The cafÃ© will seat 76 inside, 20 on the sidewalk on King Street and another 54 on a city-owned, waterfront boardwalk behind the building overlooking the marina. Rich Markus Architects were retained to design the interior layout of the new space and general contractor Patner Construction is managing the build out. Through online surveys and social media outreach, Jody and his team have outlined a menus and retail product selections that will be up to par for the community and visitors alike. Expect the best of the best, fresh locally sourced and healthful flavorful items, all in a place beautiful, quaint, enjoyable and fun. Now that is progress.